Let’s get back to cooking, shall we? I’ve been lovin’ me some Chai tea for the past few months. I found Bhakti Chai concentrate that is completely unsweetened which tastes very good—especially very gingery—that I can sweeten with whole grain syrup or steevia. I add water and drink it hot or I put it on ice and drink it cold. It doesn’t need milk at all. I don’t drink milk anyway but if you wanted something milky in it, almond milk or coconut milk would work well. 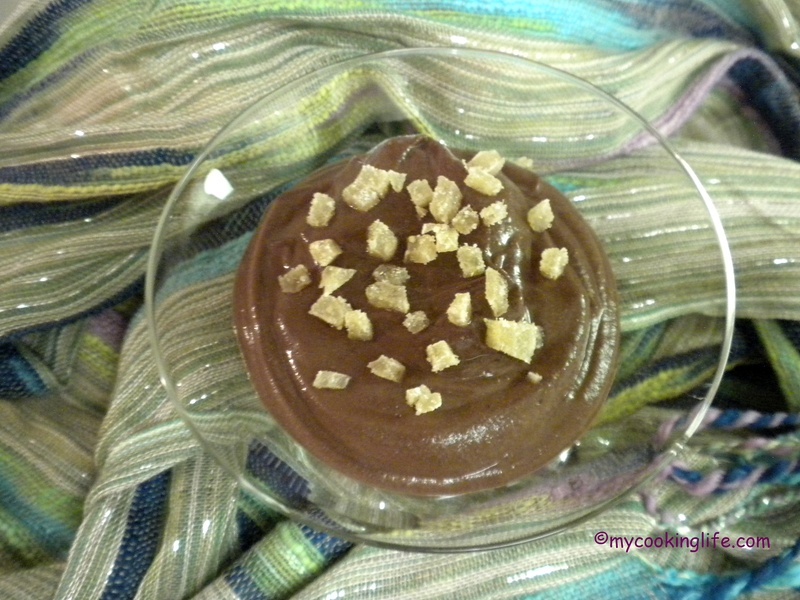 I sure do love that fresh ginger, and was inspired to try a combination of gingery chai spices with dark chocolate mousse using my own home-brewed chai. I started looking for recipes and found which spices are mainly used: ginger, cardamom, cloves, cinnamon stick, black peppercorns, fennel or anise seeds, vanilla bean pods. One recipe included bay leaves. 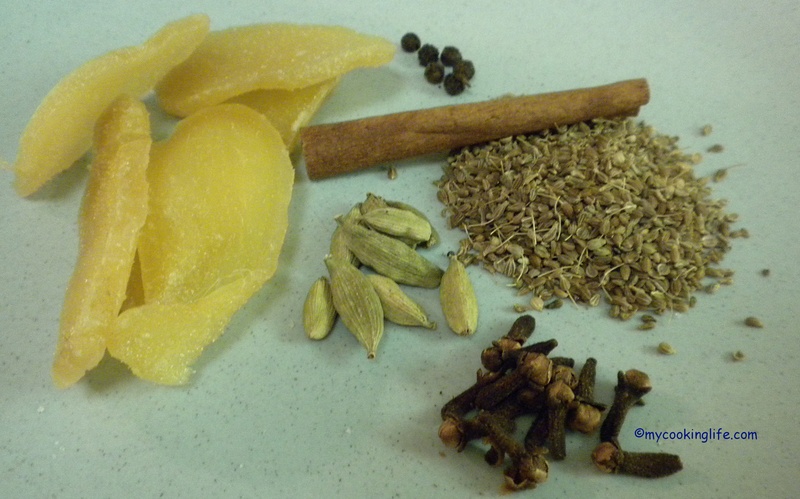 Various combinations of these spices can be brewed into black tea. One tip that I liked was to put the loose tea or tea bag into cold water and bring it to a boil rather than adding boiling water to it. This definitely affects the taste of the tea and I like it! (Clockwise from the left) ginger slices, peppercorns, cinnamon stick, anise seeds, cloves and cardamom pods. Put all the spices into a pan with cold spring water and bring up the heat. Simmer the spices in the water for 5 minutes and steep for 10 minutes. This is a very concentrated mixture and does not have any tea in it. Strain the chai mix. If you want to use these spices for chai tea, you can use these quantities of spice with 6 cups of water plus 6 teaspoons of loose tea. Bring cold water and Darjeeling tea leaves to a boil and simmer 3-5 minutes. Add almond or coconut milk and sweetener of choice. Adjust quantities for a smaller amount of tea or lighter spice. The trick to this month’s chocolate mousse will be adding the chai flavors into the mousse without making the mousse too liquidy. Mousse wants to be very thick and rich and creamy and so it doesn’t have liquid ingredients like tea. I adapted May’s Mousse recipe which came from Christina Cooks website and is 100% vegan and has no refined sugar in it. It is sweetened with dates and in order to blend up my dates, I do use a little bit of liquid, which is where my home-brewed concentrated chai comes in. I want the chai flavor to come through without overwhelming it with the cocoa. If your dates are a bit dry, chop them and put the chai liquid into a cup with the date pieces to soften them. This will help you puree those dates. I find that pureeing the dates does require some liquid. Start with about a half cup of the chai concentrate and puree the dates. Add more concentrate as needed. Add the tofu, vanilla extract and cocoa. Blend it nice and smooth! As you can see, I used firm tofu instead of silken. It has a little more body and still blends up very nicely. No need to put any other sweetener in this. My results were interesting! The date, chai, tofu and vanilla puree tasted really good without the chocolate and definitely had the chai taste. You might want to tweak this with a bit more ginger and a little stevia and serve it as is. With the cocoa added, I didn’t get a strong independent chai taste but I could definitely say the chai flavorings uplifted the chocolate and contributed wonderful undertones of chai spices. I liked it very much and in fact, I liked it much better than the May Mousse recipe. The chai concentrate definitely toned down the date flavor some which I liked. Another thing to try would be the date/chai/tofu/vanilla puree with a bit of coconut milk and just a hint of chocolate for a light milk chocolate chai dessert. This appeals to me! This entry was posted in Chocolate, Cooking, Mousse and tagged anise seeds, cardamom pods, chai spices, cloves, Darjeeling tea, easy vegan mousse, Masala chai, peppercorn by mycookinglifebypatty. Bookmark the permalink. Looks really really good! I am actually yearning for tofu after a couple of weeks without it. Strange, huh? This looks extra scrumptious. I liked it a lot because the chai flavor really blended well with the dates and rounded out the flavor.